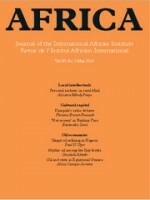 Publisher: Africa: The Journal of the International African Institute, 2013. Recent economic and socio-political dynamics in the territories that form Equatorial Guinea are related, in different ways, to the extraction of hydrocarbons from its Exclusive Economic Zone since the mid-1990s. These transformations are strongly mediated by specific social groups, especially the family that has held power since 1968 and transnational oil companies, whose relationships are central to the exclusive political configuration in the country. The article analyses this particular form of extraversion of power as part of a broader history of the region, in which the role of the state’s sovereignty as articulated during decolonization is shown to be instrumental in the allocation of rights and the political economy of oil today. The article also discusses the spaces that the new political economy of oil has opened for alternative transnational connections around the country. CAMPOS SERRANO, Alicia, “Extraction Offshore, Politics Inshore, and the Role of the State in Equatorial Guinea” en Africa: The Journal of the International African Institute, vol. 83, nº 2, 2013, pp. 314-339.